Watch Pope Francis stop motorcade to kiss head of severely disabled boy. 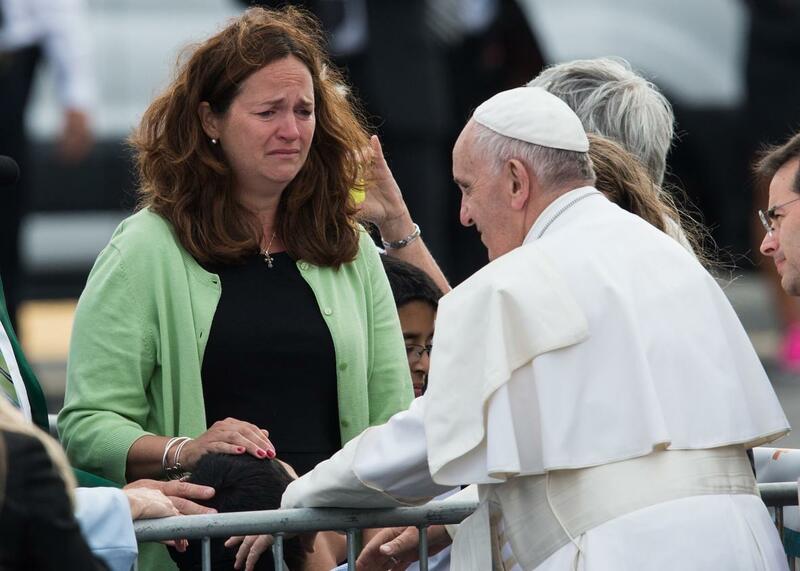 Kristin Keating cries as Pope Francis blesses her disabled son upon arrival in Philadelphia on Sept. 26, 2015, on the final leg of his six-day visit to the U.S.
Pope Francis arrived in Philadelphia on Saturday morning and managed to have an emotional moment when he had barely stepped off the plane. After shaking some hands, Francis got into his Fiat and began to drive away on the tarmac when he ordered his driver to stop. He had apparently seen 10-year-old Michael Keating out of the corner of his eye. Keating, who has cerebral palsy, was in a wheelchair at the corner of a barricade. Francis approached him, placed his hands on Michael’s head, said a blessing, and kissed him on the head. Francis then grabbed the hands of Michael’s visibly emotional mother and then shook hands with his father. Francis is expected to focus more on messages to ordinary Catholics in Philadelphia after addressing Congress and the United Nations in Washington, D.C., and New York. At a Mass with 1,600 people, the pontiff called on the Catholic Church in the U.S. to give a greater role to lay members, particularly women, reports Reuters. “It means valuing the immense contribution which women, lay and religious, have made and continue to make to the life of our communities,” he said. The pope has long objected to the idea of ordaining female priests, but he has called for them to play a bigger role in everyday church life.